Ok, it's just 12 days until Christmas! 4 Crafty Chicks #433 Masculine Greetings! I want to see some manly projects as the twist. If you're like me, you don't make nearly enough masculine cards to have for all the men in your life. And, coming from a home full of testosterone, I could surely have more in my stash! I actually made a birthday card for my older brother and am three weeks ahead of his birthday for once! His birthday is Jan. 5th and growing up he sometimes felt like it was a Christmas leftover, particularly if it snowed and hindered a party. One year that happened and I think he all he got were drumsticks and a cake. Bummer. So I try to get his gift in the mail before New Year's. This card actually took a different direction from my original plans, which was to include plaid with the coke bottle. Then, I spied this panel of grunge stamped background and coupled with the coke bottle I ditched the plaid. I really love how it turned out! Don't forget to stop by the Hen House and see the rest of the Chicks' projects. Lots of great inspiration and festive cards! Then come play along with us and give the masculine twist a try. The challenge is open until Wednesday, December 19th at Noon Mountain Time. Stamps: Grunge background (Catherine Pooler Designs); Sentiment - Fill In The Blanks (Catherine Pooler Designs); Bottle top sentiment (Inkadinkadoo); Coke bottle sentiment (My Favorite Things). Paper: White cardstock (Neenah Solar White 110lb); Chocolate (Catherine Pooler Designs); Samba inked white cardstock. Ink: Versamark; Icing On The Cake, Over Coffee, Samba (Catherine Pooler Inks). Extras: WOW White Emboss powder; Silver Emboss Powder (Stampin' Up); Coke Bottle Die-Soda Pop (My Favorite Things); Postage Stamp Die (Catherine Pooler SOA); Stitched Rectangle die (Lil' Inker Designs); Label die - Good Stuff Inside (Catherine Pooler); small circle die (Catherine Pooler). This is a fabulous card for your brother! Love that Coke bottle! 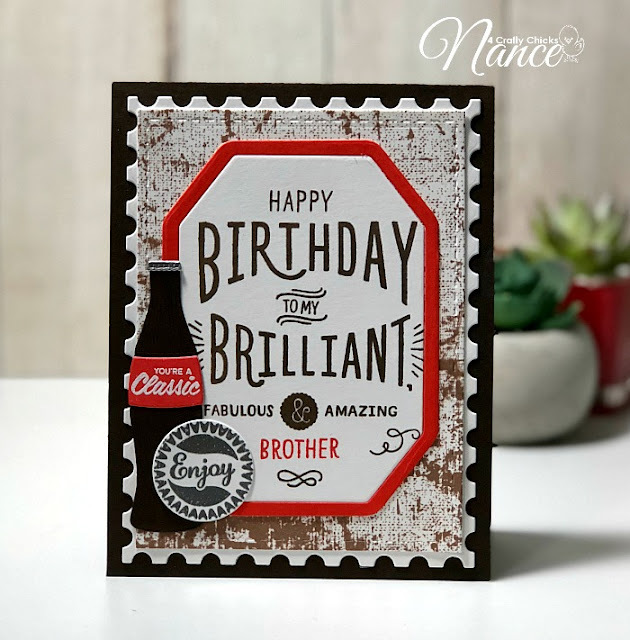 I love this card, Nance! It's so crisp and cool. Awesome design and color palette! Your brother will love it! One of my brothers has his birthday the same day as yours LOL. I LOVE your card, the grunge and the sentiment, I may even case it I love it so much! 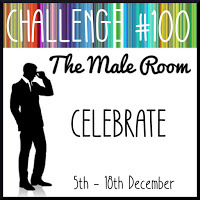 Thanks for the idea :) AND thank you so much for joining us in our Celebrate challenge at The Male Room this week. Looking forward to see you again next challenge.